We’ve all made decisions or said something that we’ve regretted and the repercussions can last a lifetime. Arthur Miller made a career out of writing about misunderstandings, lack of communication and wrong choices. It’s only when there’s a major shift in family dynamics, such as losing a parent, that the true cost of past wrongdoings are tallied up and paid by those left behind. 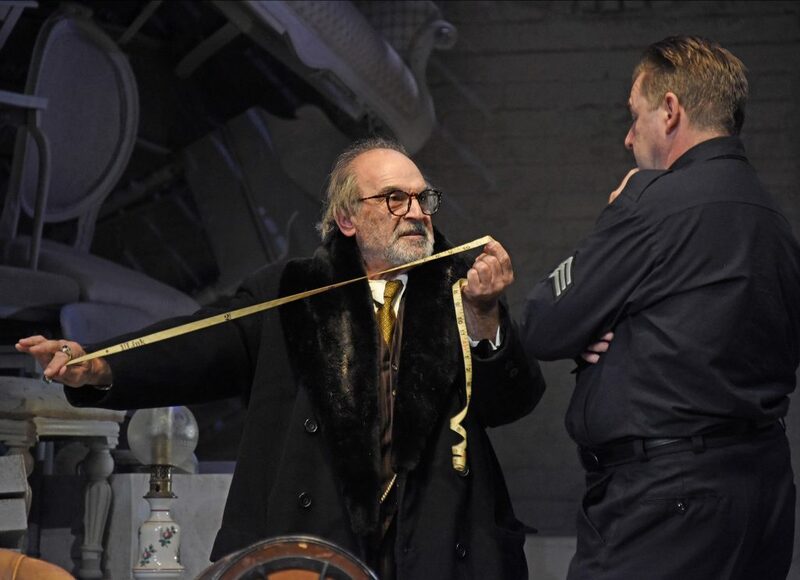 Miller’s 1968 play, The Price has just opened at Theatre Royal Bath and gives its star, David Suchet, another landmark stage role in an already exemplary career. Superficially it’s a simple story about taking wrong paths, house clearance and sorting out life’s baggage but, like all of Miller’s stories, there’s a kicker of an ending and an emotional undercurrent that is profoundly tragic. Two sons, inexplicably estranged for most of their lives, are brought together by the after-effects of their father’s death. It’s 16 years since he died and all that is left of a once grand family, made destitute following The Depression, is an attic apartment filled with memories which had been locked up and forgotten about. But now the old Manhatten Brownstone is being pulled down by developers and the rooms, stacked floor to ceiling with old furniture (another terrific set design from Simon Higlett) must finally be cleared. Victor Franz (Brendan Coyle), a New York police sergeant on the threshold of retirement after a 28-year, lacklustre career, has arranged for a dealer to come and give him a price for taking it all away. But when he arrives it’s clear that both men have their own agendas and reasons for striking a deal. Then, after considerable haggling, the transaction is thrown into doubt by the arrival of erstwhile brother Walter. Miller, as always, is writing from experience. The younger of two boys, he revered his older brother, Kermit, who was blond and athletic. During the depression, Kermit quit his studies at New York University to help the family out while Miller continued with his education, eventually graduating, in 1938, from the University of Michigan, where he won awards for his skill as a dramatist. The same family dilemma is explored in The Price. 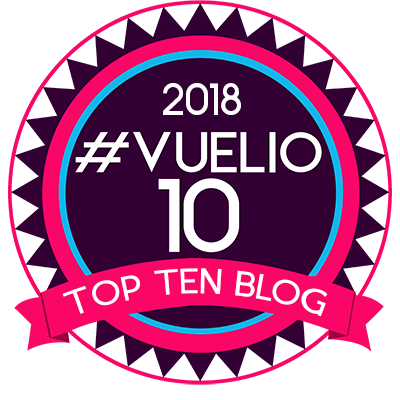 Victor, the clever son, sacrificed his career prospects to look after his ailing father, while Walter left him to it and went off to pursue a high-flying career as a surgeon. The move tore the family apart but now, back in the old family home, raking over memories, the brothers confront the past and it’s heart-wrenching. Neither has found happiness, their lives blighted by economics and history. And, like a ripple effect, their father’s depression and inertia, caused by the shock of losing everything, has been passed down. Walter, now divorced, has little contact with his children while Victor’s life has been one long struggle with poverty. In the middle of all this introspection, is Suchet’s ebullient, shrewd and surprisingly perceptive Gregory Solomon, an 89-year-old dealer (and doesn’t he look great!) who is resolutely determined to carry on in the business he loves because, if he doesn’t, what does he have? His only daughter killed herself. He’s alone. The cut and thrust of a deal is the only thing keeping him alive. All the fathers, and their children, here have paid a terrible price for words said that affected their entire lives. The reckoning isn’t pleasant. Solomon entirely dominates the play, whether he’s on stage or not. But when he’s not, when age and infirmity gets the better of him, the story and its intensity flags, as though taking a breather before the next scene. 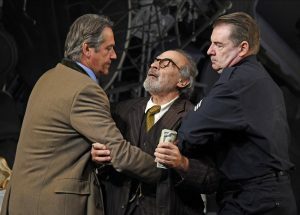 Miller has invested in the old boy the play’s heart and passion while the brothers’ dialogue and behaviour renders them unemotional and rather static. The men lob accusations at each other from either side of the stage with a gulf of silence and space between them. For the first 20 minutes or so we see a reflective Victor mulling over his past, being nagged by his disappointed wife, Esther (Sara Stewart making the most of her underwritten part). Their bickering is just beginning to irritate when Solomon sweeps into the room, coughing and wheezing after making it up the stairs. But he gives a wolfish smile, his eyes darting everywhere, taking in the profits and what he has to do to secure them. He’s charming, understanding, eager to please. The patter is well rehearsed, after all he’s been dealing with circumstances like this all his life, taking advantage of people when they’re at their most vulnerable. “I pick up the pieces,” he admits, flattering Esther, taking the measure of both of them and prevaricating. 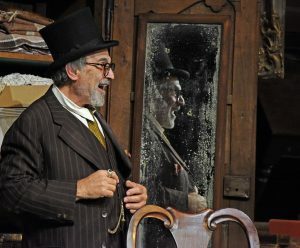 It would have been all over by the end of the first act – but, with seconds before the intermission, Walter arrives and the whole transaction must begin again. 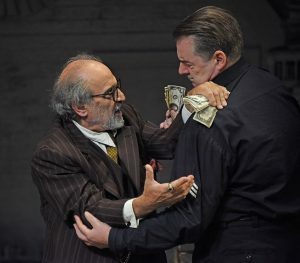 Brendan Coyle and Adrian Lukis, as the brothers, make good adversaries although you can’t help feeling that they’re stifled by Miller’s writing – or Jonathan Church’s direction (although I suspect the former). Are both men so broken by what life has given them that they are unable to rouse enough emotion to really confront each other? Victor must be seething with resentment and anger, yet it is barely evident, while Walter spends a lot of time with his hands on his hips not connecting physically or emotionally with his brother. David Suchet gives a masterclass in character acting. His enthralling performance dominates the entire production. He endears the old boy with a winning combination of benevolent Jewish hawker and mischievous opportunist. It’s an absolute triumph. The charismatic actor is much in demand at the moment with a sensational new TV series, Press, in which he plays a media baron, and roles in the upcoming starry Pinter season in London, but I do hope The Price get a a West End transfer because it deserves to be seen by a wider audience. 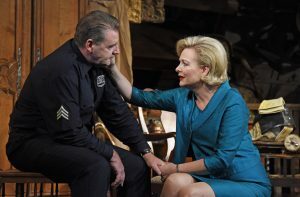 The Price runs at the Theatre Royal Bath until August 25.
Review. 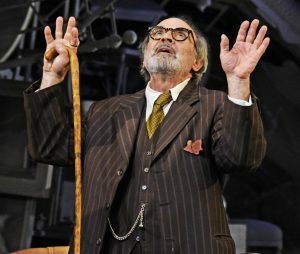 David Suchet gives a masterclass in character acting with a triumphant turn as a wily old furniture dealer in Arthur Miller’s The Price.